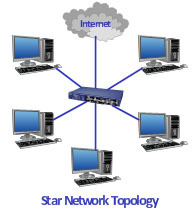 Star topology is one of the most popular network topology used now days. In this type of network topology all the computers are connected to a single hub through a cable. All the computers or systems are connected with a central device called HUB thought a wire. Signal or data sanded to hub are then transmitted to all the systems or computers in the network. Hub act as a repeater which sends data to all computer. Every node has it dedicated connection to Hub. It can be used with twisted pair, Optical fiber, coaxial cable. Since each system have a dedicated connection to hub so it is easy to troubleshoot. Performance is not effected by the number of nodes. Setup and modification is easy. It has minimum line cost . Only failed node is effected in transmission and rest remains working. Totally depend upon hub and if hub fails no communictioan take place. Cost of installation is high . Performance is based on hub capacity .